DD0317 Bromeliad Taxonomy for Beginners by Aaron Smythe, March 2015. 1. The "plant itself". Usually the leaves, sheaths and blade are commented on. 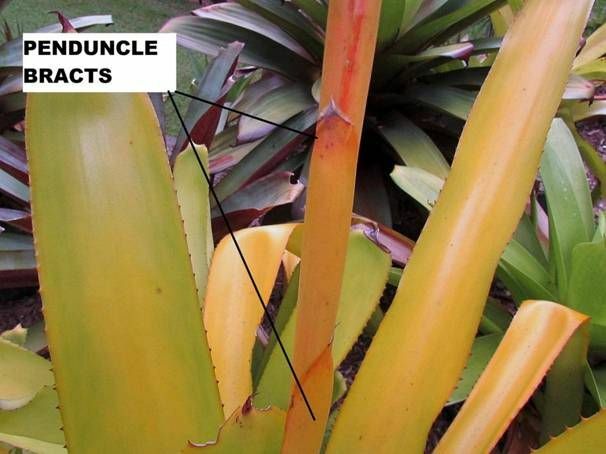 2.This next one is the inflorescence (the fertile part of the plant) and contains such features as peduncle of the inflorescence, bracts and rachis. 3.The flower which involves petals, sepals, ovary, pedicel, floral bracts anther, stamen and stigma. 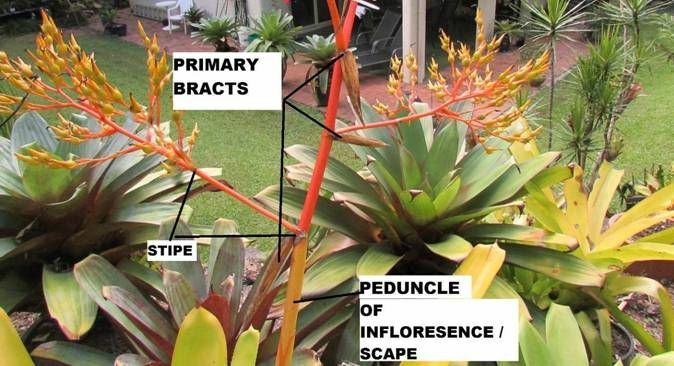 When identifying a bromeliad these terms can be used to rule “in or out” for a species. The plant structure of a bromeliad is formed by a rosette of leaves radiating from a crown. 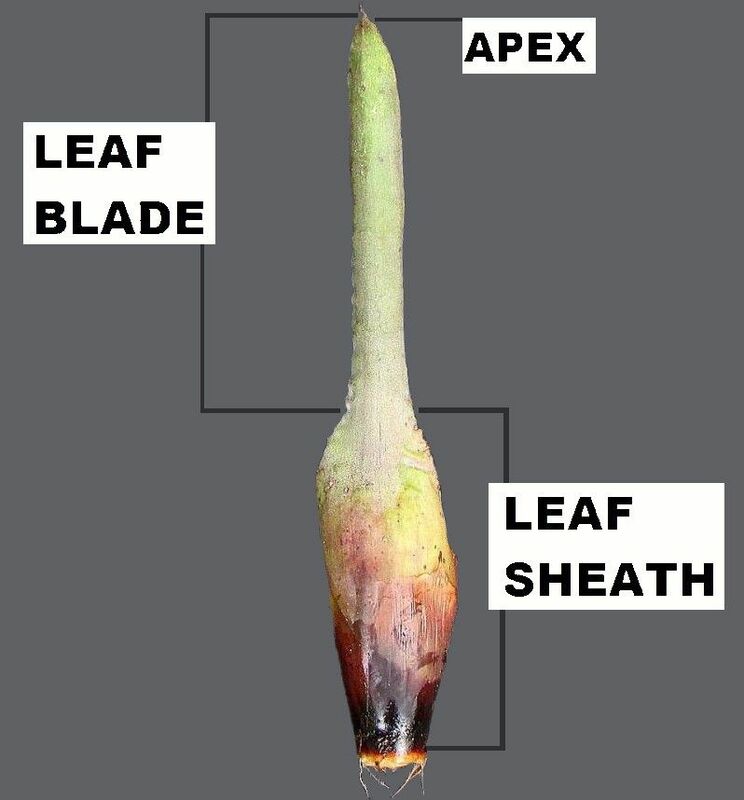 The focal parts of the leaf are the leaf sheath, leaf blade, apex and margin. The leaf sheath is the wider bottom part of the leaf that wraps around the base. The leaf blade is the upper part which protrudes from the blade. The apex is the tip or end of the leaf and the margins are the outside of the leaf. A bromeliad plant can be arranged alternately (distichous) as well as rosette (polystichous). 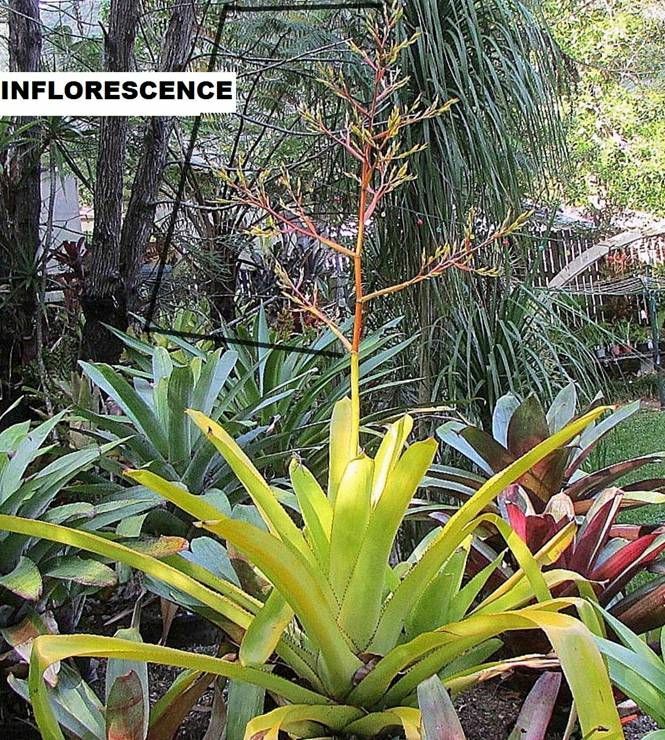 Only the non-ambiguous fertile section of the inflorescence is marked here. The section considered to be the inflorescence for the plant is thought of differently amongst botanists but should mean all parts for displaying flowers including peduncle. The area holding the inflorescence is the “peduncle of inflorescence” which is the stalk of the inflorescence. The “stipe” is a term used to cover the bottom part of a branch. Peduncle bracts are located on the peduncle. Bracts are a modified type of leaf. The flowering structure has 3 main external parts which are the petal (leaf like structure), sepal (contains the petals) and floral bract. The internal components in this picture are the anther (the pollen bearing part at the top of the stamen and the stigma (the top of the female portion of the flower that receives pollen). 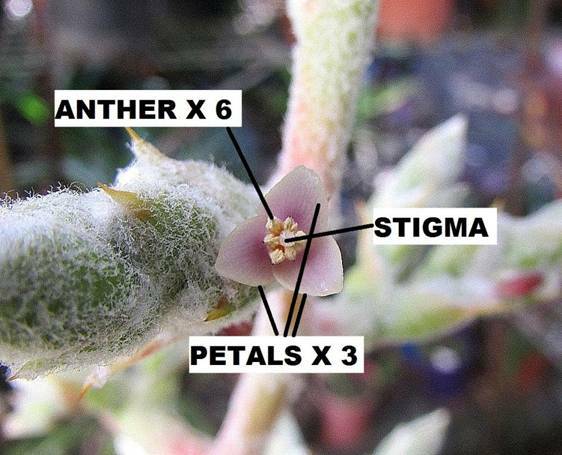 There are 6 x anther, 1 x stigma and 3 petals in bromeliads. The stigma is the terminal section of the female organ, which is called a carpel. The anther is the terminal section of the male organ, which is called a stamen. 4. The Implements that I use. 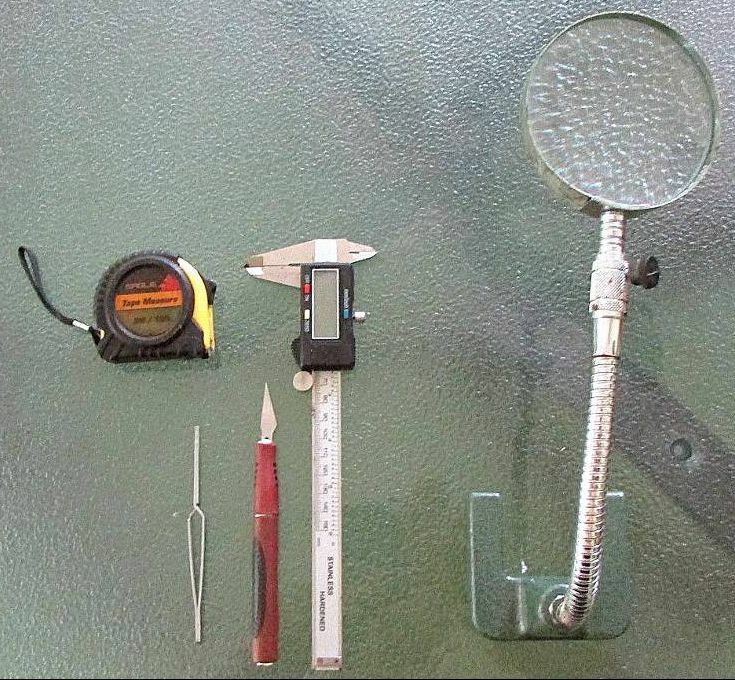 From left - Tape measure for the larger measurements, tweezers, a sharp scalpel type knife, a digital calliper for the smaller measurements and a magnifying glass as I am not as young as I used to be. I have been told by those who have been doing this sort of thing for a long time that I am very brave as taxonomy will drive me insane and that all taxonomists argue! I have tried to keep this simple for myself and others who are venturing down the road of deciphering species and their descriptions. All you will need to do now is learn the Latin (link to glossary above) that describes colour, pattern, shape etc and take your measurements. Have fun and as Lyman Smith said "Botany is an art as well as a science."